The first Glastonbury festival at Worthy Farm was held on the day after Jimi Hendrix died. 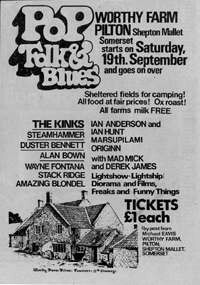 It was the Bath Festival of Blues and Progressive Music 1970 that had inspired farm owner Micheal Eavis to begin a festival of his own. On the 19th September 1970 the first Glastonbury Festival took place at Worthy Farm in Somerset. Organised by dairy farmer Michael Eavis, the event was billed as the Pilton Pop, Blues & Folk Festival and attracted 1,500 people who paid a pound each to see a number of bands on a single stage and drink as much milk as they wanted. The two-day festival was inspired by Eavis’ visit to the nearby Bath Festival of Blues and Progressive Music albeit on a much smaller scale. Described by performer Ian Anderson as ‘ramshackle’ the festival was a very laid-back affair. With a stage constructed of scaffolding and plywood, security provided by local Hell’s Angels, and with the Kinks pulling out from the headline spot, there was no indication from the first festival of the size and significance that the event would become. It’s said that the Kinks’ Ray Davies had got a doctor’s note to say he had a throat infection and couldn’t sing after reading in Melody Maker that the event was only a ‘mini-festival’. However, Eavis struck lucky by securing T.Rex as replacement headliners just as Ride a White Swan was about to take the number 1 spot in the charts. Despite the legends associated with Glastonbury, Marc Bolan’s experience of the first festival wasn’t entirely positive – his fancy car got covered in mud, and Eavis was only able to pay his fee in installments. Despite the great time had by everybody, the festival ultimately lost £1,500 and was only resurrected the next year thanks to money from its supporters.
'' 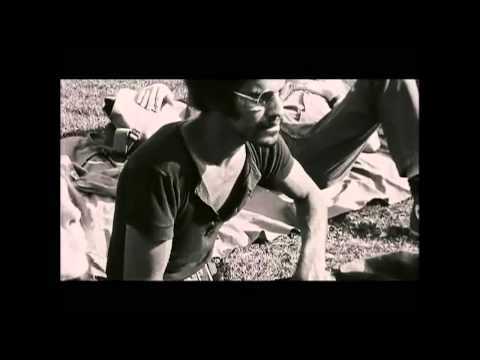 glastonbury music festival '' - newsreel item - 19/9/1970.